Since the availability of Sony’s first PlayStation, a new console launch means pretty much one thing; a new Ridge Racer. Nintendo’s 3DS is no different, bringing Namco’s legendary racer to the small, 3D screen. It’s one of two racing games currently available for the system, competing with mobile favourite Asphalt for a spot in your 3DS. Let’s take a look and see if its insane drifting action is worth your hard-earned ash. If you’ve ever played Ridge Racer, you’ll know exactly what to expect – and this one’s no different, even paying homage to previous games in the series through its recycled and remixed tracks – both racing and musical. It’s a pure action arcade racer, eschewing things like licenced cars, areas and realism. Instead, what you get is decal-adorned muscle-cars screeching through powerslides around corners at incomprehensible speeds – only now in 3D. It plays quite simply; there’s a face button for accelerating, and one for braking. Easing off the accelerator and then quickly re-applying throttle around a corner starts up a drift, in to which you must counter-steer for maximum efficacy. Drifting also charges up your 3 standard nitrous bars, which lets you turbo-boost at opportune moments. This time though, it allows you to unleash two or even 3 bars at the same time giving the game an incredible sense of speed that’s reminiscent of futuristic racer Wipeout. It’s a game that despite having a button for the purpose, almost insists that you never slow down; crashing in to walls or opponents hardly affects your momentum, slowing you down just enough for the guy behind you to shoot past. If you are struggling though, there are some interesting race modifiers you can purchase using the credits you earn through regular racing. Throw down some virtual cash, and you can start out with your nitrous bars filled, or with a starting boost. Your cars are upgradable too, so it’s possible to purchase mods that do things like build your nitrous level whether you’re drifting or not. 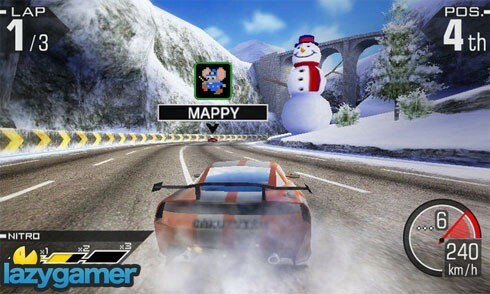 The game’s meat is in its pretty damned extensive, non-linear, threaded Grand Prix mode – similar to the one introduced in Rage Racer and seen in the PSP’s launch game. It starts off a little dull, with a large set of beginner’s races that feel like a bit of a grind, with guaranteed victory. Stick with it though, because 3 hours later, when you’re break out of the novice races you’ll find some the best, fastest white-knuckled action racing you’ll likely ever play. It becomes terribly tight, and your heart-rate will thump up as you battle to take the insane hairpin turns with the necessary utmost precision to best the AI racers. The game also includes local 4 player multiplayer, but the lack of online play is a glaring omission. It’s made up for – somewhat – by cool use of the 3DS spotpass and streetpass features. Walk past another Ridge Racer player and you’ll swop ghost data so you can compete against people you’ve never even meet. The whole package is rounded out with quick race and time trial modes, making this game more than worth your money. Obviously, the big new thing about this iteration of Ridge Racer is the 3D; and it doesn’t disappoint. Though it’s easily the game I’ve played to date that causes the most eye-strain, it’s also the one with the most popping, eye catching 3D. The games neon night-time city skylines, concrete jungles and desert-island backdrops all come to life in 3D, and the depth of view presented makes a pretty compelling case for the implementation of 3D for all racing games. It’s a bit of a pity though that the game’s very low-resolution textures sully its visuals, making it look a bit like a relic from gaming generations past. Thing is? It really doesn’t matter, because Ridge Racer 3D is an insane amount of fun. 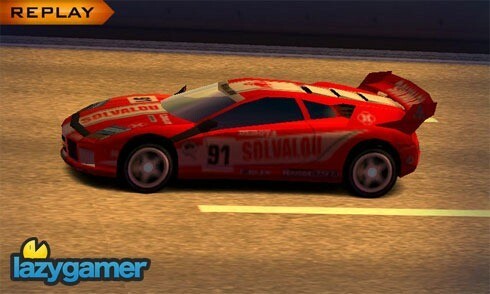 It’s the same Ridge Racer you’ve been playing for 15 years, with a few nice tweaks and additions. that’s actually not a bad thing. Menus and 3D implementation is slick, but the recycled tracks and low-res textures dminish the wow-factor. If Ridge Racer is your sort of racing game, you’ll get hours and hours of ridiculously fast-paced racing out of this. Yes, it’s the same Ridge Racer and yes it’s the same tracks you’ve been playing for years – but it’s just as fun as it ever was, and the shiny new 3D only makes it better. It’s not only the best racing game available for the 3DS right now, it’s also one of the system’s best games.